Getting the best print quality is what a lot of people look for in their printer and print resolution is what you should be looking for when considering this. 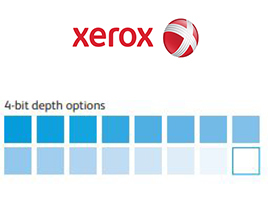 Print resolution is measured in dots per inch (dpi), but you’ll find that some Xerox printers have 4-bit depth colour technology, as do some Kyocera models, which is rated at 600 x 600 dpi. However, these devices can actually produce output that compares well to devices rated at a much higher resolution. So, let’s find out why. In short, dots per inch relates to how many dots are produced when printing a document. The higher the dpi, the more dots are produced resulting in finer lines and more detailed output. This ultimately means you’re less likely to be able to see gaps, fades and blurred prints. Take a more in depth look at print resolution. Following on from the above dots per inch example, this means that in each dot position the device can print no dot, or a dot that consists of a fixed amount of toner. This stops the ability of printing various shades of colours and can result in poor print quality when trying to produce documents of various colours and shades. This is where you really get some benefit as 4-bit depth allows you to print varying amounts of toner at each dot position. This means you can start to print different shading at each dot position, enabling you to print something that looks a lot closer to how you want it to look. In fact, each dot can have as many as 16 shades of colour resulting in smoother colour transitions and more colour levels. You can see from this how a printer with 600 x 600dpi and 4-bit technology could produce superior prints to a printer with 1200 x 1200 dpi but with only 1-bit depth. Check out the Xerox VersaLink C400/500/600 to take advantage of this enhanced quality.